The 100 years from the end of the 15th to the end of the 16th century is known in Japan as the Sengoku Jidai, the Warring States Era (or Era of the Country at War), named after a period in China during the third century c.e. The Ashikaga Shogunate, established in 1338, and headquartered in Kyoto, enjoyed approximately a century of power. The shogunal government, or bakufu, was, however, unstable because it depended on deputies to look after its interests in the provinces and became ineffective when the original bonds between the shoguns and their deputies loosened with time. The deputies, who were hereditary military governors, consolidated their holdings by appointing a single heir (a son, not necessarily the eldest) rather than letting all sons inherit a portion of their holdings, organized local warriors as military officers, and recruited peasants as soldiers. The nature of war changed during this period. Individual combat between heavily mounted aristocrats was replaced by large armies of foot-soldiers armed with pikes, and, after the appearance of Portuguese in 1543, with muskets. The widespread use of muskets and cannons revolutionized warfare and resulted in the building of formidable castles. Prolonged warfare decimated aristocratic families and allowed talented lower-class men to challenge their superiors, the most remarkable example being Toyotomi Hideyoshi. Born a peasant, he rose to unify Japan through ambition and treachery. General lawlessness also led to the emergence of armed and powerful religious sects, the most powerful being the True Pureland Buddhists, who controlled a province on the Sea of Japan and strongholds in the Kyoto-Osaka region. Shogun Yoshinori , who attempted to strengthen the bakufu by checking the power of the military governors, was assassinated by one of them in 1441. 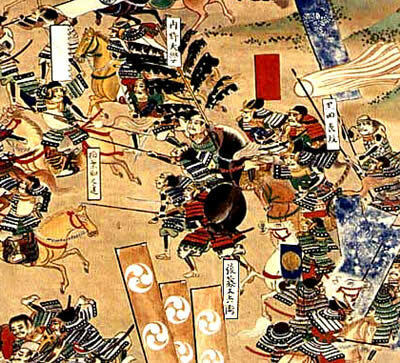 From then on, the shogunal government began to fall apart, culminating in the Onin War (1467–77) fought between two claimants seeking to be Yoshinori’s successor, championed by two factions of the ruling family. 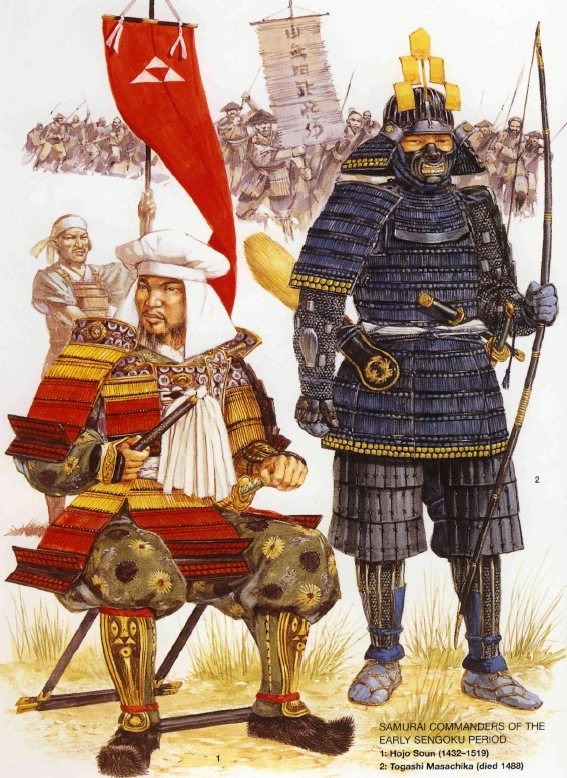 Samurai Commanders of the early Sengoku period. The war destroyed the remaining authority of the shogunate, ended the system on which it was built, and led to a century of endemic warfare called the Sengoku Jidai. The wars continued because no single family or leader emerged to unify the country. The needs of war led the successful contenders to consolidate their holdings and form alliances by pledging allegiance to more powerful lords in a pattern similar to feudalism in Europe during the Middle Ages. The territorial lords were called daimyo . Early Europeans who traveled to Japan mistakenly called the daimyo kings or princes. In the second half of the 16th century, the process of unification would advance under three leaders, Oda Nobunaga (1534–82), Toyotomi Hideyoshi (1542–98), and Tokugawa Ieyasu (1542–1616). The Sengoku era was also culturally brilliant and economically vibrant. The imperial court, also in Kyoto, was both powerless and poverty stricken. The shoguns continued to use their great wealth to patronize the arts, building magnificent palaces and temples in Kyoto and sponsoring dramatic presentations. Poetry and painting flourished, influenced by Zen Buddhism, as did landscaping and the tea ceremony, all influenced by the aesthetics of Song (Sung) dynasty China. Similarly many daimyo also patronized the arts. The economy grew, despite as well as stimulated by the wars. Agricultural advances produced surpluses that generated trade, mainly with China and Korea. Widespread piracy led the Ming government of China to negotiate a system of officially sanctioned and regulated trade with the shoguns, which was unsuccessful because the bakufu lacked the power of enforcement. Japan imported porcelains, paintings, books, medicine, and copper coins from China and exported raw materials, such as copper and sulfur, as well as finished products such as swords, decorative screens, and folding fans, indicative of sophisticated manufacturing and craft industries in Japan. Towns and ports flourished—for example Hataka in Kyushu (the destination of Qubilai Khan’s invading fleet)—the center for trade with Korea. Money was replacing barter trade, initially in the form of coins imported from China, later also in the form of bills of exchange. The Sengoku era was important in Japanese history as a transition period from a decentralized estate and feudal system to a centralized feudal state. It was also an era of cultural brilliance and economic growth.